Food cooked and eaten in October. Measure peanut butter into a small bowl. Pour hot water. Whisk quickly until smooth. Add the rest of the dressing ingredients. Mix well. Steam or bake sweet potato. Chop scallion, celery stalk small. Slice cucumber. Shred or thinly slice carrot. Remove stems out of kale leaves. I do this just by hands. Chop the leaves. Drain tofu cutlet. Rinse with hot water. Pat it dry. Slice 1/2″ thickness. Put soy sauce in a small plate. Dip sliced tofu in soy sauce both side. Bake them in an oven toaster until surface become dry about 3 minutes. Dip them in soy sauce again. Toast again. Cut them bite size or use them as they are. Place all the salad ingredients in a big bowl. Pour 1/2 of the dressing all over. Mix them. Eat. 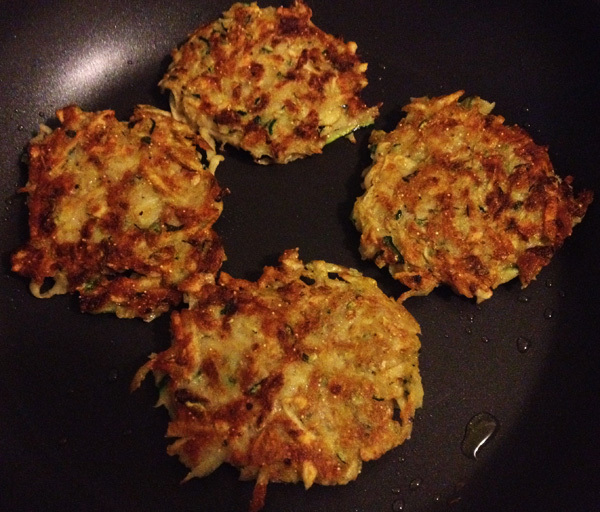 My friend made Alice Waters’ Potato Zucchini Pancakes the other day. I followed the same recipe exception of switching eggs to flax seeds, and flour to GF flour mix. Voilà! Equally yummy savory pancakes were made. Easy. Mix zucchini, potatoes and ½ teaspoon salt. Place in a colander for about 10 minutes. Squeeze out extra water. In the meantime cook onions with some oil in a pan until translucent. Add the garlic and cook for one more minute. Set aside. Add olive oil, ground flax seeds, flour, baking powder and ½ teaspoon salt into zucchini and onion mixture in a big bowl. Stir until well combined. Heat some oil in a bigger pan (medium-high heat) and drop the batter in portions. I use a ¼ cup to measure out the pancakes. Flatten the pancakes with a fork. Fry until crispy on both sides, flipping them when edges turn brown. I cooked 5 minutes each side. I visited a friend who lives near Bear Mountain 2 weekends ago. 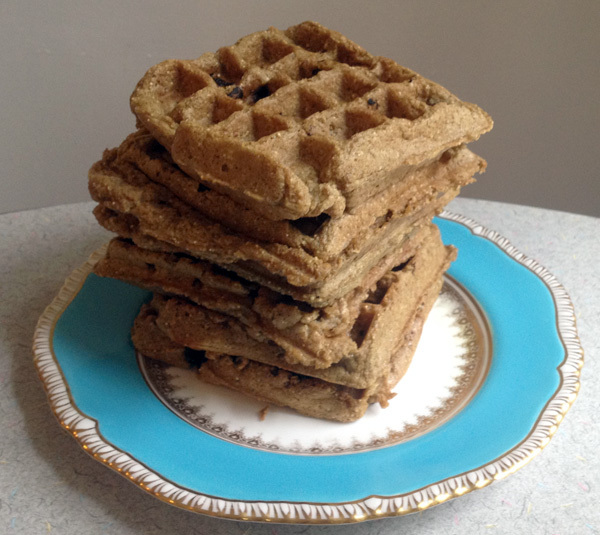 She was making chocolate waffles for her whole family’s a week-long breakfasts, by using a store bought pancake-mix while her 11 hens were laying eggs all day long in the backyard. I no longer eat eggs, but come on! She said it was just so easy and so tasty and asked me to share an easy tasty pancake recipe. Here it is. This is for you, Yuka. Soak flaxseeds in water. Let it sit. Pour vinegar into milk. Mix all other liquid ingredients into the milk mix as well. Mix flour, sugar, B.P., B.S., and salt into a big bowl. Put flaxseed egg into the milk mix. Beat it with a whisk until lumps are gone. Pour the liquid mix into the flour bowl. Mix well. Lightly grease a waffle maker surface or a frying pan. Heat it at a desired temperature. Cook the batter until it is gone. *optional: Sprinkle 8-9 chocolate chips per waffle before you close the lid. I had an old childhood friend visiting from Japan last week. 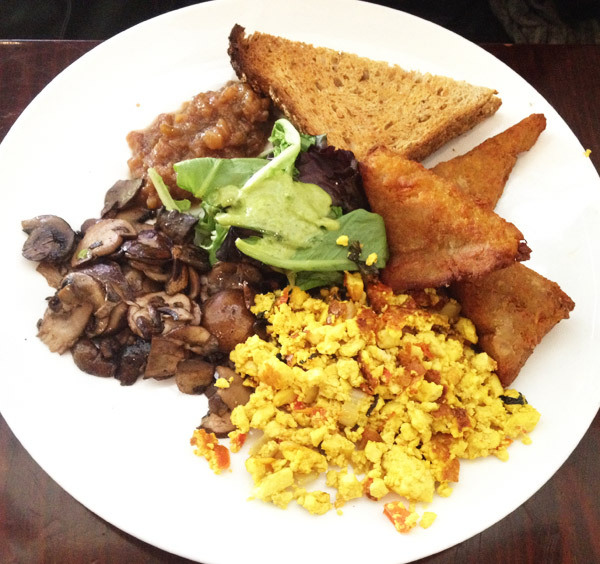 I took her to my favorite vegan restaurant in NYC, Cafe Blossom (Upper Westside). 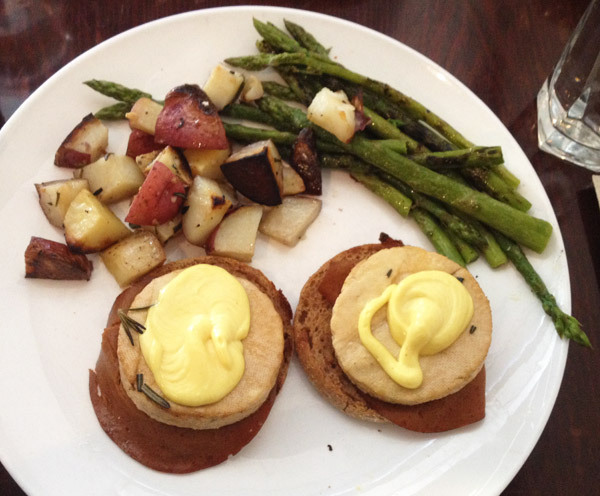 She ordered Country Breakfast, so I had to order tofu Benedict. Yum yum! A few days later I ordered Country Breakfast at the original location on 9th Ave. They looked very different. 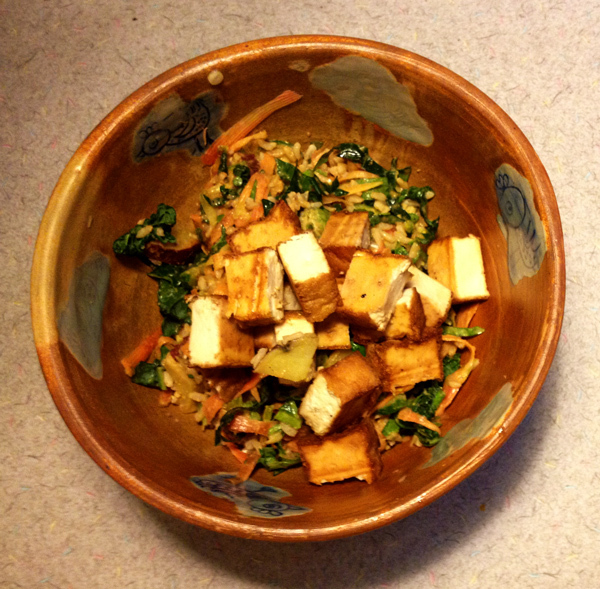 Here at Upper Westside, scramble tofu, sweet potato hash, and sauteéd mushrooms were separate as I expected. at 9th Ave location, they were all mixed into 1 mound. Sorry I forgot to take a picture of that. It was still tasty. A couple friends of mine invited me to their Tikitober Party. I was told to bring something Polynesian or German. 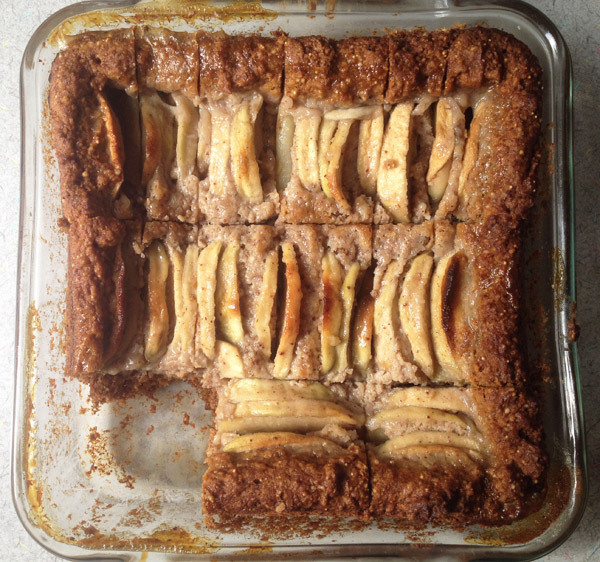 I decided to bake a GF Apfel Kuchen. How is that possible? It is so possible, but I had to taste it even before I took a picture. Thus there is a hole in the cake. Make Apple Topping. Peel and core apples, then cut into ¼ inch slices. Mix with sugar, cinnamon and arrowroot starch. Let them sit. Mix wet ingredients: melted earthbalance, apple sauce, milk, lemon juice and zest, and flax eggs. Mix dry ingredients: GF flour, salt, baking soda, baking powder, and sugar. Add dry into wet, 1 cup at a time, mixing well after each cup. Knead very lightly. Spread dough in a well-greased and dusted cake pan, pushing it up on the sides as for pie crusts. Line up or stagger the apple slices in rows on top of dough. Bake for 10-15 minutes at 375°F. Reduce the heat to 350°F, and bake for additional 30 minutes or until done. Finally I made a decent home made GF bread! Yay! 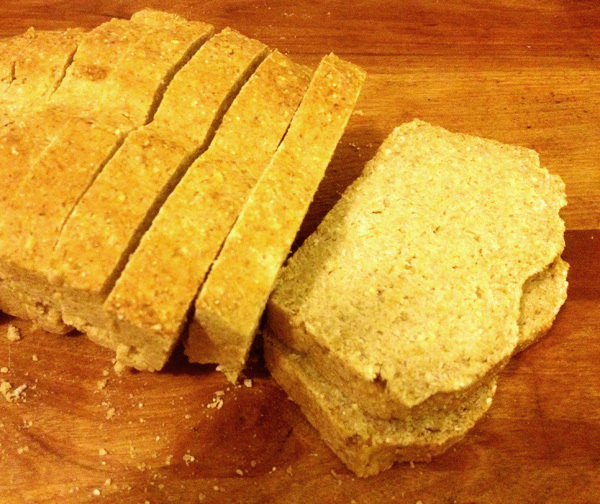 This a hearty dense multi-grain bread, which I like. If you are looking for a fluffy white bread, this is not. In a small mixing bowl, combine the honey and the hot water. Sprinkle in the yeast and give it a quick stir. Leave it in a warm place for 10 minutes. In a small bowl, whisk together the flax eggs, oil, honey, and vinegar. When the yeast is done proofing, add the wet ingredients to the dry ingredients. Mix well. Slowly add the yeast mixture. Scrape the sides of the bowl, then mix for 2 – 3 minutes or until the dough is smooth. When bread is finished rising, bake in a preheated 375 ºF oven for about 30 minutes or until done. Allow the loaf to completely cool before slicing. 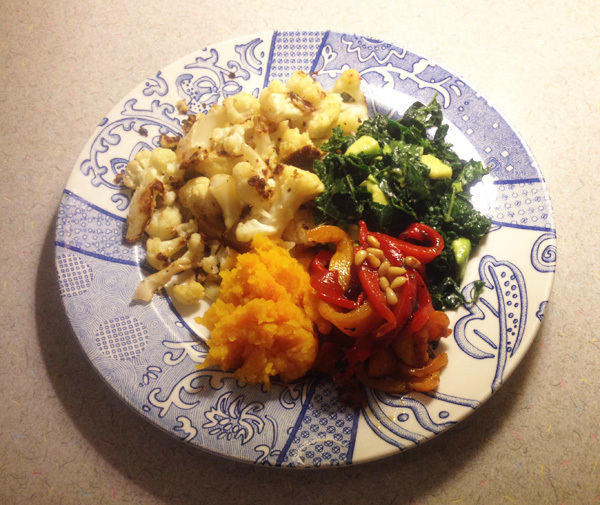 Another roasted vegetable dinner for fall. I usually pan fry cauliflower, but for night since I had so many other things can go in oven, I decided to roast them in oven. Bell peppers were fired roasted at stove top. Add kale avocado salad, and home made multi-grain bread, there is a dinner. Popcorn Cauliflower: Wash and divide them into small florets. Toss with olive oil and sea salt. Use about 1 tsp salt for 1 head of cauliflower. Spread them on a baking sheet avoiding to overwrap. Roasted at 375ºF for about 10-20 minutes until they become partially golden. Flip them after 10 minutes. Butternut Squash: Half length wise. Scoop out seeds. You can wash the seeds and dry roast as well. Splash olive oil on the cut side and rub it with finger. Sprinkle salt. Place on a baking sheet face down. Roasted at 375ºF for about 30 minutes. Test with a bamboo stick. When it’s done, scoop out meat. Mash little bit. Season with salt and pepper if you like. Bell Peppers: Place them over medium heat on a stove top directly. Rotate them every few minutes to char all over. It will take about 10 minutes all together. When it’s charred all over, put it in a small bowl or pan and cover. Let it steam. when they are cool enough to touch, peel with fingers. Do not rinse with water. The wonderful charred flavor will disappear. Toss with a splash of balsamic vinegar, olive oil, salt, pepper and toasted pine nuts.